This is an amazing Deluxe Kismet Gift Set for any family fun night! 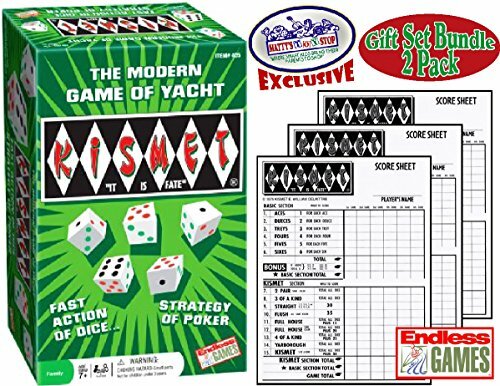 A classic from 1964, Kismet is a high energy, fast paced dice game that pits chance against strategy. Five tri-colored dice increase the odds, and make for dozens of scoring combinations. Kismet makes a great addition to any game enthusiasts collection or to the family game collection. *Items ship together in a brown corrugated box. Kismet is a fast paced dice game that pits chance against strategy, great family fun! Five tri-colored dice increase the odds and make for dozens of scoring combinations. For Ages 7 and up & 1 or more players! If you have any questions about this product by Endless Games, contact us by completing and submitting the form below. If you are looking for a specif part number, please include it with your message.